Prepare for Flight. Alliances want their robots to climb aboard their airships so they can assist the pilots during the race. Robots operate independently from pre-programmed instructions for the first 15 seconds. Alliances score points by: Reaching their baseline, delivering gears to the airship and scoring fuel into the boilers. Operators take control for the final two minutes and fifteen seconds. Alliances continue to score points by: Collecting and delivering gears to their airship, scoring fuel in the boilers, climbing the ropes on their airship to prepare for flight, populating gear trains to start rotors and defending against other alliances. 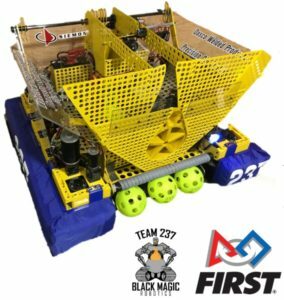 Robot Description: Team 237’s robot was built on a crab drive base. A crab drive base has a drive “pod” at each corner of the base. Each pod has two motors, one to drive the wheel and the other to turn the wheel 360 Degrees around. The unique drive system allows the robot to drive in any direction at any time. The robot has 3 key mechanisms to play the game. At the front was a passive chute that could be used to collect gears from the human player and drop them off at the airship. In the middle of the robot was a fuel collection and shooting system that could pick up fuel from the ground or be dumped into from the hoppers. These balls could then be shot into the boiler using a wheel. Lastly was a spinning claw mounted to the top back of the robot that could grab and climb the rope to board the airship at the end of the match.